Sugarwood Haven can be rented without the pool house as a 3 bedroom 2.5 bath home that sleeps 10 during the off-season. Please contact Oversee Rentals for details. Sugarwood Haven is a travelers dream destination. This lovely beach home is in the heart of Seagrove and an easy 250 steps to the white sandy beaches. You will also find yourself less than a mile from Seaside which makes an evening concert an easy bike ride away! The outdoor entertainment area is the heart of this beach home with over 1500 sq ft of outdoor entertaining space. Spend your days in the sun splashing around in the large private pool or lounging on the outside seating. When you need to take a break from the heat head over to the 500 sq ft lanai to watch your favorite team play on the outdoor television under the shade. The newly constructed pool house sleeps 8. The open floor plan is bright, fun and nautically appointed. The full kitchen has granite counters and a large island for dining with the living room looking out to the pool. It has a king bed in one bedroom, a twin bed and bunk bed in the other, which has a full bed on the bottom and twin bed on the top. There is also a sleeper sofa in the living room. The main house has an inverted floor plan; the sleeping areas are on the first floor and the living areas are on the second floor. Upon entering the property, the bunk room has two sets of twin bunk beds as well as a guest bedroom with a king bed. These bedrooms share the full hall bath. At the back of the house is the master suite with a king bed and French doors that open up to the pool and outside entertainment area. The large master suite has dual sinks and a large wheel chair accessible shower. Upstairs is inspired by European contemporary design with large family gatherings in mind. The kitchen boasts all new stainless steel appliances, subway glass tiled backsplash, and a large center island perfect for preparing family meals. The upper deck patio overlooks the pool and pool house, and is a great escape for grilling and dining "Al Fresco" or just enjoying sunset cocktails. 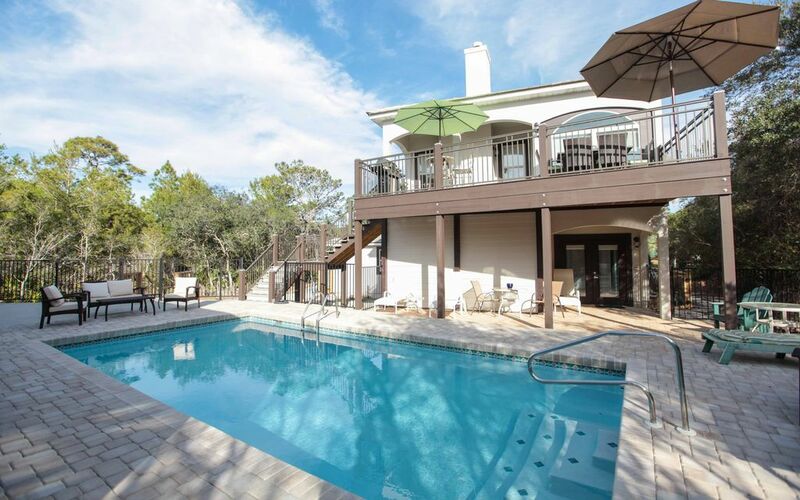 This home is perfect for a joint family beach vacation or large party getaway! Our first time visiting the area, couldn&#x2019;t have been happier with the experience. There were 11 of us there, 6 adults and 5 kids ages 9 and under. 1. Location: Just a couple hundred feet off 30A, and another couple hundred feet across 30A to the beach access. The beach was perfect, and not too crowded in this area. Quiet enough. Easy access to nearby restaurants and activities. A long walk (~3/4 mile) to downtown Seaside. 2. Rooms: No complaints. Beds reasonably comfortable. Pillows weren&#x2019;t good for me, but that&#x2019;s a very subjective thing. 3. Cleanliness: Overall, very good. Only complaints (minor) are that the grill was filthy and in poor condition overall. There was a dirty wine glass left outside from the previous renters, and dirty towels left on the washing machine (still had plenty of clean ones though). 4. Management company: Excellent. Very friendly and responsive. The pool needed some TLC during our stay, and it was taken care of quickly. 5. Other issues: My biggest complaint was the extreme variety of cheap cookware and tools. I don&#x2019;t expect to have high quality cookware like I have at home. But there was such a mish-mosh of terrible-quality cookware and cooking tools that it was very frustrating. While the kitchen stuff was very annoying, I would *highly* recommend Sugarwood Haven overall. Hi Thomas, we are glad you had such a great experience with Oversee at Sugarwood Haven. We hope to see you again soon. We had a family stay that was very fun and pleasant. Hi James, we are thrilled that you had a fun and pleasant family stay. We hope to see you again soon. Sugar Haven has it all , well stocked kitchen and pool house . Enough room for all of my grandkids to have their own space .Home away from Home. Hi Cindy, we are so glad the Sugarwood Haven felt like your home away from home. We hope to see you again soon. We had a wonderful time during our stay at Sugarwood Haven. We had ample room, the outside area and pool were awesome, and close to everything. We will stay here again for sure. Hi Dorothy, we are so glad you had such a wonderful time at Sugarwood Haven. We hope to see you again soon. Hey Pete, its great that you had such a fun time at Sugarwood Haven! We hope to see you again soon. This home was above our expectations. The ease of getting to the beach and to the square was closer than I thought. Great place for multiple families as well, with the pool house being fully furnished for extra space. Outdoor spaces were very nice as well. Kitchen was well stocked with plenty of seating for all. I would highly recommend to any of my friends. Thanks for a great Spring Break! Hi Kathy, it sounds like you and your group have found your Santa Rosa Beach spring break home. It was a pleasure having you and we hope to see you again soon. Rates are subject to change based on occupancy rate and booking date. To find a more accurate rate, click “book it” or “detailed price” and enter your dates, this quote takes precedence over the rates shown above. Rates above do not include cleaning fees and taxes.